Recipe: Danish ‘Fastelavnsboller’ – Lent Buns – the way Granny Erna made them. So, you’ve probably heard about the Swedish Lent buns, semlor… They are ever so popular, even abroad. But the Danes often make this version of Lent Buns – also worth a go, especially if you are not into marzipan and whipped cream. 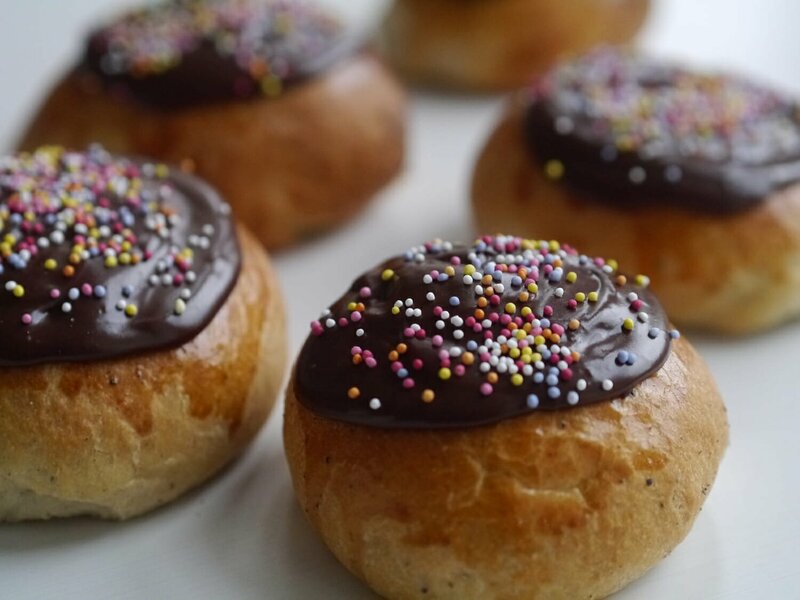 ‘Fastelavnsboller’ are eaten on the Monday before Lent in Denmark, not the Tuesday –because we Danes celebrate the Carnival on the Monday before Shrove Tuesday. The kids dress up in fancy dress – and then play a type of Pinata (with a real barrel). After that, they go door to door and do the Danish version of trick or treating (for money or sweets) to maximise their candy intake for the day. And we eat buns. Lots of buns. At Danish bakeries, you will find these are made with a type of pastry dough – like Danish pastry, more flaky. At home, however, people make these yeast dough buns – heavier and more wholesome. Add the milk to a saucepan with the vanilla and bring to boiling point. In a food mixer, whisk the sugar, eggs and corn flour together. Pour 1/3 of the hot milk into the egg mixture at medium speed, then pour the whole lot back into the saucepan. Bring back to the boil, taking care not to burn. It needs to be at boiling point to thicken (around 30 secs). Take off the heat. Add the butter and stir. Transfer to a cooler bowl and leave to set. If using fresh yeast, add the warm milk to a mixing bowl and add the yeast; stir until dissolved, then pour into the bowl of the food mixer. If using dry ACTIVE yeast, pour the warm milk into a bowl, sprinkle in the yeast and whisk together. Cover with cling film and leave in a warm place for about 15 minutes to become bubbly. Pour into the bowl of a food mixer fitted with a dough hook. Start the machine and add the cooled, super soft butter. Allow to combine with the yeast for 1 minute or so, then add the sugar. Allow to combine for 1 minute. In a separate bowl, weigh out 400 g/3 cups of the flour, add the cardamom and salt and mix together. Start adding the flour and spices into the milk mixture, bit by bit. Add the beaten egg. Keep kneading for 5 minutes. You may need to add more flour – you want the mixture to end up a bit sticky, but not so much that it sticks to your finger if you poke it. It is better not to add too much flour as this will result in dry buns. You can always add more later. Once mixed, leave the dough in a bowl and cover with a dish towel or cling film. Allow to rise for around 30 minutes or until it has doubled in size. Dust a table top with flour and turn out the dough. Using your hands, knead the dough and work in more flour if needed. Using a rolling pin, roll out the dough to a 30 x 40 cm rectangle (approx). Cut the dough into 12 equal squares. On each square, add a good tablespoon of pastry cream. Gather the corners together on top, then slowly gather the sides, too, to ensure the pastry cream stays inside the bun and won’t seep out during baking. When bun is completely closed, turn over and place on a lined baking tray, seam side down. Leave the buns to rise for a further 20-25 minutes. Turn the oven to 180/200C and heat up. Brush the buns with egg. Pop the buns in and bake for 10-12 minutes or until golden and baked through. Leave to cool. Baking time may vary depending on your oven - adjust baking time accordingly. Melt the chocolate. Mix the icing sugar with a tablespoon of hot water, maybe another one… Until you have a thick, smooth mixture. Add the melted chocolate and stir until smooth, then set aside to cool a bit (or your buns will have melted icing all over). Top each bun with chocolate icing, add sprinkles – and serve. I have kept the recipe for the buns very similar to the dough we use for cinnamon buns, although we had added extra butter and a bit of baking powder. Note that these buns are also served in some families in Norway, although Norwegians have both this version and also the version closer to the 'semla' - but with jam inside as well as whipped cream. It is hard to be super specific about origins of some Scandi foods sometimes because all countries are so close and sometimes recipes travel across borders or via families. But in any case, this particular recipe is similar to what my Danish grandmother would make for Lent.